At this time of year half my emails are full of praise and wonderful stories (thank you!) and the other half are full of tales of unresponsive older kids, inattentive younger kids and every discipline problem in between. Amazing material *and* strong, clear discipline. Of course we’re not talking canes and beatings, we’re talking about good solid teaching techniques that let the kids know what is expected and where the limits are, all in a loving, caring, respectful & inspiring atmosphere. And as I’ve been having so many emails, I figured I’d recap here some of my best classroom discipline techniques. 1. The Agreement – without a doubt the most important technique you’ll ever use, you need it in every course. 2. The Bad Kids at the Back – using the “proximity effect” to cure those rabblers on the back row! 3. How to get a class of perfect angels! – this simple exercise will change your whole teaching. 4. The helper! – if you just have one or two crazy kids in class. 6. Shutting a game down in the middle – useful if you forget one of the rules of a game and chaos ensues. 8. Power Teaching – a lot of great techniques that a lot of teachers (myself included!) have found really useful. 10. Genki English Book Club Recommendation: Life Ki-Do – a treasure trove of empowering discipline techniques. 11. Prizes & Addiction: Give them or not? 12. The Agreement – I’m putting it in again as it really is that important! “The Devil finds work for idle hands” is certainly a truism and there is a reason Japanese and Korean kids aren’t hanging out on street corners – they don’t have time! So keep teenagers busy. Never be afraid to fire a student. Even with all the best intentions, some students will just simply never work out in your school. In that case don’t worry about letting them go. It’s much fairer to let them find a new path elsewhere rather than the keep them suffering in class, disrupting others and giving you super stress. You, and they, deserve a (as far as we can!) stress free work environment. We have to reach as many kids as we can, but we can never reach them all. Help the ones you can. OK, I think that covers just about everything. Remember it takes time to learn these techniques, and some kids will always push you. But however student centered we make the learning, the actual responsibility of the class is yours. You are the boss, not them. So read through everything here and try everything out. Genki English Rule No. 2 is “If you lose, just try again!” and it works just as much for us as it does for the kids. And at the end of the day do make sure you are teaching a fantastic course that *really* helps the kids *and* makes things fun for them. There is a reason we’ve spent so many years building and building Genki English. Discipline techniques can make an amazing class shine, but it can’t patch up a sinking ship. So really evaluate every part of every lesson, every learning outcome you are wanting to achieve and every game, song, idea & technique you are planning to use to truly make your lessons world class and be the very, very best for your kids. Because however bad some kids may seem, they all deserve the best. So be strong, have fun, earn respect and let the kids know that everything you do is for them. A heart of gold illuminates the world, but on the inside is as hard as nails! P.S. 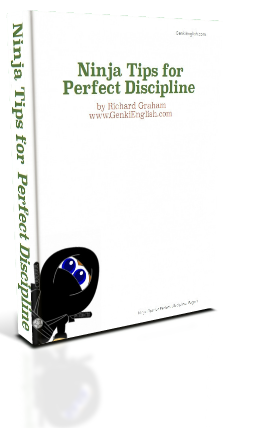 For VIP Members, you can now download all my Ninja Discipline Tips in this super convenient pdf. If you’re not a VIP member yet, order your Teacher’s Set today and you can download it too. With the stree they’ll save you, the tips inside are almost worth the whole price of the set on their own! you – are – amazing!!! What fabulous ressources you have and are still creating, thanks so much for sharing it all, it is very inspiring. I love following your blogs and have learnt a lot of great ideas from your experience. One question, how do your enforce the “agreement”, so that it’s not forgotten a week later? You just keep a “zero tolerance” policy where if the kids get close to breaking one of their commitments, so (usually jokingly!) warn them. And if they do break one of the rules you punish them. e.g. if they are not being respectful to each other, then they get no game. Or cut out the computer time! Just keep consistent and always enforce everything. Those rules are great to apply when you teach at elementary schools, but when you run your own school and students attendance is not compulsory, it becomes less black and white. In saying that, most parents are supportive of any disciplinary actions I take! But definitely, drawing boundaries and staying consistent is important. It actually works out better the other way around. Because you always have the option of “firing” students in your own school the parents have to agree to support the discipline and play by the rules, otherwise they are thrown out! Which, again with the scarcity, always works in your favour because the parents will want to go to the school that is so good they can afford to fire people! It’s a privilege to have a teacher like yourself! Your experience in discipline control is very practical and helpful. It is as important as the Genki teaching material. You are a real expert in teaching! Dear my Genki teacher! I really see how important of discipline in classroom. I can’t go on the next step of teaching if my students aren’t in the rules we’ve made agreement. Good to wait for students cooling down and get ready to go on. Need time to keep them in our rules and tight up everyday. I’m a teacher in Republic of Maldives. Students have no respect and much discipline problem. I will try some of these techniques. I teach International 1st grade classes in a 99% native population attendance school. We did The Agreement in class today, which was needed after yesterday’s abysmal class. I drew up a scroll on the blackboard and wrote simplified terms for us to abide by. The students were super excited to sign their names on the board under mine, and thought the terms were fair. It was brilliant and the class was far more respectful and disciplined. I’d like to add a suggestion here. Anyone here use BRAIN BREAKS? They are great! I use them all the time and the kids love them! Their favorite breaks are those that go with some sort of physical movement. The only catch with these, is that you must have good control of your class. These can go wild on you, so keep a close eye on those kids.